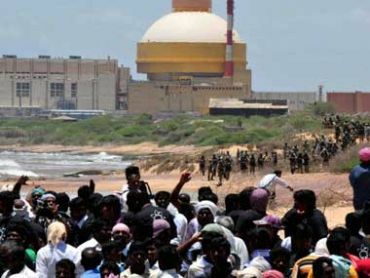 Three persons from Australia were on Thursday prevented from entering Idinthakarai, the epicentre of protests by People's Movement Against Nuclear Energy leading the stir against Kudankulam Nuclear Power Plant in Tirunelveli district, the police said. Filmmaker David Bradbury along with his wife and son arrived in India on tourist visas and were about to enter Idinthankarai from Kanyakumari district on Thursday morning when the police stopped them near Radhapuram police station, they said. "After interrogations, the three were made to go back, since prohibitory orders were in place," an officer said. The PMANE has been leading protests against the plant for over a year citing safety concerns. Commissioning of the first unit of the Indo-Russian project was originally scheduled for December last year, but has been delayed due to the protest.